Artificial intelligence offers water companies a cost-effective way of boosting customer engagement – one of the key demands of PR19 – through the deployment of chatbots. Paul Shepherd writes. Customer engagement is the hot topic in the world of water right now. Customer service reports continue to highlight poor performance, and Ofwat regulation in the form of PR19 clearly sets out that more needs to be done. But far from being worried, we should be optimistic for providers and excited for customers about the changes that are about to take place. Why? Because we have been working with a number of water and utility companies to leverage artificial intelligence (AI), in the form of chatbots via messenger platform technology (Facebook messenger, Whats­App and the like), and the benefits to both customers and businesses are huge. The Institute of Customer Service’s biannual UK Customer Satisfaction Index ranked water and energy companies as among the lowest performing sectors when it comes to customer service in its July 2017 report. Of the 13 sectors included, water and energy performed only marginally better than transport and the telecommunications and media sector, despite an improvement in service of 5.7 points since July 2014, the biggest improvement of all the sectors. • First, great customer service. Ofwat has made it clear that providers need to do more for their customers, and encourage them to become active participants in decisions relating to future plans and strategies. They also need to deliver ­better customer services – setting new standards and learning from the best examples of other industries in order to deliver an improved experience. • Second, resilience. Ofwat wants companies to consider operational, financial and corporate resilience, thinking about the long-term future as well as the next five years and ensuring common standards are implemented. • The third area of focus is affordability. Ofwat’s push is for providers to deliver affordable bills for all, both now and into the future, doing more to help vulnerable customers, those in difficult circumstances and to reduce bad debts. • The final measure is innovation, finding new ways to work, exploring new markets. Ofwat says there will be payment for results delivered against this outcome, with rewards for those companies that not just improve efficiency and resilience but which set new standards for customer service and cost efficiency. While there has been a fair amount of commentary that raising standards will be a real “challenge” for water companies, what we are about to see is a real revolution in terms of customer communications from water companies, not just bringing them into line with other industries, but leading the charge for better business. The PR19 framework positively promotes the need for greater digital communications, and this is the key to successful change for the water industry. 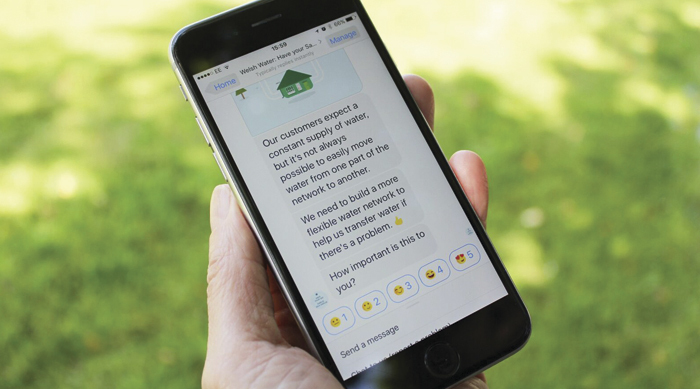 Chatbots, which use technology to enable a conversation through online messaging platforms such as Facebook messenger, are not just a hot new social media trend – they offer a real and credible solution for water companies to customer engagement, with additional benefits that will help providers meet other PR19 requirements too. Available on a platform that many customers (especially millennials and centennials who are now becoming customers in their own right as they come of working age and take on their own homes), know and enjoy using, chatbots offer 24-hour access. Using AI, they can have a conversation with a customer and through every question asked and answer given they get smarter. Chatbots can be personalised to fit certain needs, such as dealing with customer service issues or engaging with customers to get direct feedback. When it comes to customer service, a chatbot has a number of advantages. It offers a real-time conversation at any time of day or night, enabling customers to benefit from getting responses at a time that is convenient to them, not just during office hours. What is more, there is no need for providers to make customer service agents available round the clock, at considerable additional expense. While critics will argue that they cannot answer everything, they will be able to deal with common queries quickly and efficiently, and where a human touch is needed for full resolution of the case, the details of what the customer’s issue is will have been captured, enabling a swift resolution – and without the need for the customer to repeat their problem to new members of staff. So customers benefit from instant access, unconstrained by opening hours, and businesses benefit with longer opening hours and by being able to focus their staff on dealing with harder-to-resolve cases requiring more attention. This in turn will save on costs, one of the key outcomes required under PR19, and will improve outcomes for customers by providing a swifter response to queries through the bot and enabling a more dedicated resource from agents dealing with complex matters, which can therefore also be dealt with more promptly. As well as customer service, chatbots are already a proven tool for customer engagement and feedback. Where paper forms, telephone surveys and even links in emails can be off-putting to customers and receive minimal engagement due to the time and effort required to do them, chatbots offer a much simpler, more interactive and flexible solution. They can be set up to present a snapshot of an issue or problem and then allow a customer to vote or feed back on how they feel about it. Familiarity of platform, flexibility over the time of day they can be completed plus the versatility of being able to access the messenger platforms on any device with internet capability means the choice of how to complete the feedback sits squarely with the customer. Given PR19’s requirement for ­businesses to actively encourage participation in ­decision-making from customers, chatbots offer a resourceful, flexible, digital solution. While the road to better customer service and improved engagement between water companies and their customers may have some way to go before it catches up with service-leading sectors such as retail, food and tourism, the future looks bright. Chatbots offer a solution that will aid many of the outcomes described in PR19. We are already working with several water and energy companies to deliver projects in support of these goals, and fully expect others within the industry to use this exciting ­technology too. With Ofwat’s promise of payment for results and its desire to see more companies exploit new digital technology, chatbots could be a wise investment on more than one level. Welsh Water is the UK’s only not-for-profit water company. Every day it supplies 1.4 million homes and businesses in Wales and Herefordshire with more than 828 million litres of water, as well as cleaning wastewater so it can be returned to rivers and seas. The fourth-largest company in Wales with over 3,000 employees, its not-for-profit status means that instead of rewarding shareholders, any profits made are reinvested into the business for the benefit of customers. Involving customers in decision-making has been a core focus for the business over the past 12 months and its latest campaign, “Have Your Say”, was designed to gather the views of more than 20,000 customers to help inform strategic plans for the future and ensure the business can deliver an even better service. The Have Your Say campaign used a number of tools to present information and gather feedback from customers, including: TV and radio ads; turning a disused shipping container into a “water bar” and taking it to festivals to gather direct feedback; a series of “reservoir vlogs” which received over 300,000 views on YouTube; a website and, perhaps most excitingly, a world and industry first: a Welsh-English bilingual chatbot. The chatbot, built by We Build Bots, operates on Facebook messenger and was designed to reach demographic groups that are traditionally less likely to have their say – including young people and centennials, who are becoming customers in their own right for the first time. The chatbot itself is relatively simple. First it presents information on a range of issues, for example flood and pollution risks, education programmes, paying more for water to subsidise those in financial difficulty, cleaning up beaches, water quality, colour and taste. It then asks respondents to rate using emojis on a scale of 1 to 5 how important each area is to them as a customer. As well as being a world first, the chatbot enabled outreach to a wider demographic of customers, meaning the views received were supremely valuable. Feedback received via the chatbot during the “have your say” will actively inform the future strategy of Welsh Water, making it a successful investment now and for the future.